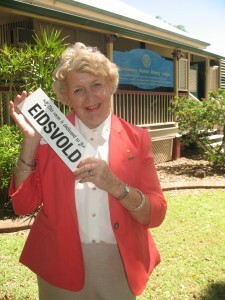 The town of Eidsvold moves its name to a bedroom following the result of this year’s Rotary Lodge Naming Rights Challenge. This is the first time (in the three years the challenge has been running) that the town will have a bedroom named in its honour coming in fourth place. The result is primarily due to a market day that is organised by Dot Hamilton each year and supported by the small community. The Naming Rights Challenge was a fundraising initiative by the Bundaberg Health Services Foundation which manages and leases the Lodge. Foundation chairman Janet Tallon congratulated every community group and individual donor who had made a contribution to this challenge. The Naming Rights Challenge is now underway again and will run through until September 30, 2014. “This is a large project being undertaken by the Foundation with our biggest expense being a monthly lease of $2800,’’ Mrs Tallon said. “The North Burnett has wanted this facility for over 10 years and when we had the opportunity to at lease rent a premises to see the project came to fruition in 2011 we worked forward to achieve it with support of local Rotary Clubs. “In the past financial year the Foundation has outlayed $45, 977 in rent and expenses to ensure the doors remain open for patients and carers in their time of need and as a local charity we rely on donations and support from the North Burnett and Bundaberg communities. The Lodge offers five bedrooms and shared dining, lounge kitchen, laundry and bathroom facilities. Public and private patients using medical services at either Bundaberg Hospital, the Mater Misericordiae or Friendly Society Private Hospital and their escorts were welcome at the Lodge. For further information on the naming rites challenge, to register a fundraising event for the Lodge or to book into the Lodge please phone the Foundation on 4150 2863. This entry was posted on Tuesday, December 10th, 2013 at 6:41 am	and is filed under Rotary Lodge News. You can follow any responses to this entry through the RSS 2.0 feed. Both comments and pings are currently closed.